Some photos are up on the Photos page of last weekend's Thunder Style Tai Chi and Six Harmony Praying Mantis workshops. An article from Master Bai The Study of Wushu: A good way to see yourself and find yourself (pdf file). It has been added to the column on the right hand side of this page. Master Kurt Wong is offering 2 workshops this fall. 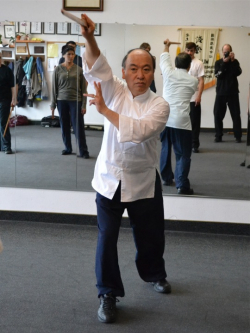 Thunder Style Chen Tai Chi will be from 1:00pm to 3:00pm Saturday and Sunday, November 3rd & 4th. This will be followed each day by a second workshop, Jing Ji Tsang Hua (Six Harmony Praying Mantis), from 3:15pm to 5:30pm. All students are welcome. A sign-up sheet is posted at the school, or email info@wutanalaska.com to be added to the list. Here is a link to a 2018 November Workshop description (pdf file). It has also been added to the column on the right hand side of this page. Some photos are up on the Photos page of the San Tsai Jien and Lan Jie Praying Mantis workshops held last weekend in Girdwood. Master Kurt Wong is offering 2 workshops this summer. San Tsai Jien (Three Powers Sword) will be from 1:00pm to 3:30pm Saturday and Sunday, June 23 & 24. This will be followed each day by a second workshop, Lan Jie Praying Mantis (Randomly Collected), from 3:30pm to 6:00pm. Both workshops will be held in the Girdwood Community Center. Here is a link to a 2018 June Workshop description (pdf file). It has also been added to the column on the right hand side of this page. A few photos are up on the Photos page of the Asian Cultural and Martial Arts Expo '18. 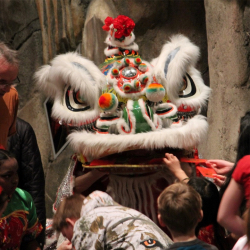 Some photos are up on the Photos page of the Chinese New Year's celebration at East High. Wu Tan Alaska is offering a new class. 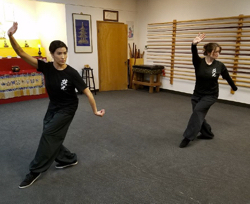 Beginning March 2, 2018, Yang style Tai Chi classes with instructors Sifu Krystal Schott and Leilani Keller will be held on Fridays from 7:30pm to 8:30pm. Here is a link to the Yang Tai Chi Flyer (pdf file). It has also been added to the column on the right hand side of this page. The Year of the Dog. The Alaska Chinese Association presents the Chinese New Year celebration at East Anchorage High School, Sunday, February 18, 2018. 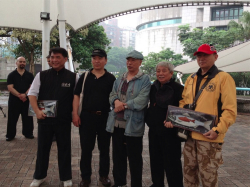 Here is a link to a new Alaska Chinese Association Newsletter. Here is a link to a new Wu Tan Brochure (pdf file). It has also been added to the column on the right hand side of this page. Bagua, cancelled. A 2-hour class will be held the following Sunday. Photos are posted on the Photos page of the Bazhou and 18 Lohan seminars. Some photos are up on the Photos page of the 2017 Summer Camp held in Girdwood. Bazhou is an advanced form in the Mei Hua Tanglang system (Plum Blossom Praying Mantis). The seminar will cover the first section of Bazhou. 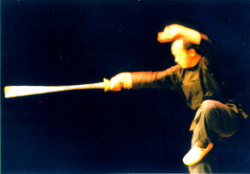 The form includes a variety of elbow strikes, leaping forearm strikes, many applications of Guo Sho (hooking or plucking hand), and incorporates tilting and falling torso techniques unique to the Mei Hua system. 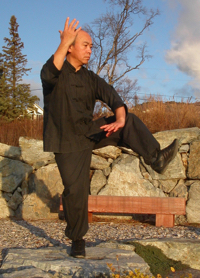 This form was initially introduced to Wu Tan Alaska by Master Tony Yang at the request of Master Wong. This seminar is open to anyone who has taken Praying Mantis classes. The 18 Lohan are a set of exercises designed to lengthen the tendons, strengthen the bones and muscles, sharpen focus, and enhance mental acuity to improve health and vitality in martial practice. There are 3 components (yin/yang/balancing) to each exercise making 54 separate exercises. 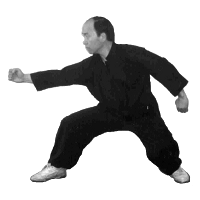 As a martial arts Qi Kung (Tanglangquan in particular), the focus is on the flow of qi from the internal to the external to allow the practitioner to mobilize power. Some of these movements are very physically demanding so please be aware of your limits when performing these exercises. This set was passed to Wu Tan Alaska from Master Su at the request of Master Wong. Saturday, July 15, Bazhou, 12:00-2:00, and 18 Lohan 2:30-4:30. Sunday, July 16, Bazhou, 1:00-2:00, and 18 Lohan 2:30-4:30. Saturday, July 22, Bazhou, 12:00-2:00, and 18 Lohan 2:30-4:30. Sunday, July 23, Bazhou, 1:00-2:00, and 18 Lohan 2:30-4:30. There will also be manuals for sale for each seminar, price yet to be determined. First, a reminder that 2017 Summer Camp is approaching quickly (July 7-11). Second, the very welcome news that Sifu Kevin will be returning to Alaska and will be spending some time in Anchorage. There are tentative plans for two seminars to be offered by Sifu Kevin in later July: Praying Mantis 8 Elbows and 18 Lohan. Check this page for dates and details. Also, note that Master Bai will be returning to Anchorage for a visit in August or September. Some photos are up on the Photos page of the Asian Cultural and Martial Arts Expo '17. This year's Martial Arts Expo will be held on Saturday, March 4th, from 5pm until 7pm at West High School Auditorium. Please plan to attend to support the community. This will be the school's 34th year of participation in this event. The Year of the Rooster. The Alaska Chinese Association presents the Chinese New Year celebration at East Anchorage High School, Sunday, January 29, 2017. Rehearsal is Saturday, January 28 at 4pm. Volunteers are needed for setup at 3:30pm and to help in the kitchen Sunday morning. Contact Nick for details. Some photos are posted on the Photos page of Saturday's new Sifus' ceremony. "...has demonstrated the skills, knowledge, and loyalty necessary to obtain the title of "Sifu" while studying under the guidance and leadership of Master Kurt Wong, in the lineage of Grandmaster Liu Yun Chaio, and to be added to the ranks of the many teachers before them. 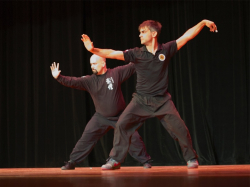 Their selfless dedication to the study of the Traditional Chinese Martial Arts as a Sifu under the Wu Tan system and their continued pursuit to preserve these arts, brings great credit upon themselves and their future students..."
The ceremony will be held Saturday, October 29, from 3pm to 5pm, and will be followed by a potluck. All students and their families are welcome to attend. Congratulations to Nick, Krystal, and Adam from all of us. 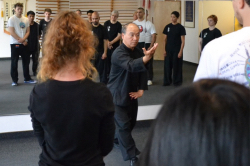 Some photos are posted on the Photos page of last weeks's Chen Tai Chi Seminar Photos. Here is a link to the Summer Camp Registration & Waiver (pdf file). It has also been added to the column on the right hand side of this page. Again, contact Nick if you have any questions. Master Kurt Wong is offering a 5-day summer camp intensive next July. The focus is Ba Gua. Here is a link to the 2017 Summer Camp Flyer (pdf file). This link is also added to the column on the right hand side of this page for future reference. The registration form will be available on this page soon. Contact Nick if you have any questions. 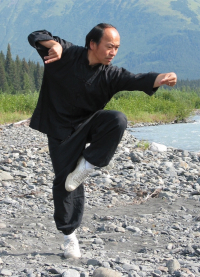 Wu Tan Alaska is offering a Chen Tai Chi Applications and Variations seminar, "Embracing the Tiger", conducted by Sifu Jacob Carpenter. Tentative schedule is October 15th and 16th, 1pm to 3pm each day. Check this page for confirmation of the dates. Wu Tan Alaska is offering a new class. 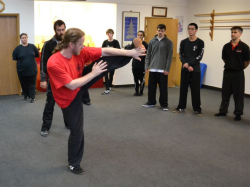 Hsing Yi classes with instructor Jacob Carpenter will be held on Saturdays from 12 noon to 1pm. Some photos are up on the Photos page of last weekend's very well-attended Hsing Yi Five Elements Fist seminar. A Fightland blog from February of this year, "Wu Tang and the Three Levels of a Martial Artist" by Nick Wong, has been added to the Articles section of the library. Thanks to Nick and Fightland. Master Kurt Wong is offering a Hsing Yi seminar July 9th & 10th, 1pm to 3pm each day, at the school. This seminar is open to all. Some photos are posted (belatedly) of last January's Discipleship Ceremony welcoming Leilani, Terence, and Joseph as new disciples. Also a photo from Saturday's windy and successful Feng Mo Gwun seminar. 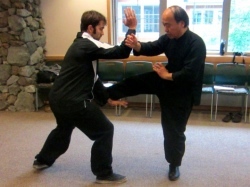 An Inside Kung Fu article from 2001 "The Explosive Power of Bajiquan" by Master Kurt Wong and Paolo Castaneda has been added to the Articles section of the library. A big thank you to Larry Motschenbacher for copying and emailing the article to us. Wu Tan Alaska is offering a "Wind Devil Staff" (Feng Mo Gwun) seminar, conducted by Nick Lynch and Adam Lewis. This seminar was given in Norway several years ago by Master Wong and the video of that seminar can be viewed on our Library/Videos page. The place is Ray E. Storck Homestead park. The time is 9am to 1pm, Saturday, June 18. Watch this page for further details. The discipleship ceremony for the induction of three new disciples will be held at 10am on Sunday, January 3. Sunday morning discipleship class will be held early, from 8:30am to 10am. A Piqua seminar is scheduled for Saturday & Sunday, January 30th & 31st. A very good way to start the new year. Check here for more info. Some photos are posted on the Photos page of last month's Push Hands seminar. The Year of the Ram. The Alaska Chinese Association presents the Chinese New Year celebration at East Anchorage High School, Sunday, February 22, 2015. Here is a link to the online poster. This year's Martial Arts Expo will be held on Sunday, March 1st, from 5pm until 7pm at West High School Auditorium. This will be the school's 32nd year of participation in this event. 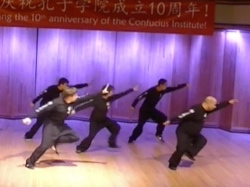 A new video of some of the senior students performing at the Confucious Institute Anniversary at UAA last September has been uploaded to YouTube. A link has been embedded in the Videos section of the library. Beginning January 1, 2015, there will be a modest increase in tuition rates. New rates are on the Class Schedule. All students please fill out a new classes form listing classes to be taken and tuition. A Push Hands seminar is scheduled for Saturday & Sunday, January 10th & 11th, 1pm to 3pm both days. A very good way to start the new year. This link, Summer Camp Registration/Waiver (pdf file) has been added to the column on the right hand side of this page. Master Kurt Wong is offering a 5-day summer camp next July. This invitation is being extended to students in Alaska, Australia, Norway, and Taiwan. Here is a link to the Summer Camp Flyer (pdf file). This link is also added to the column on the right hand side of this page for future reference. Updates and changes will be noted on this page. 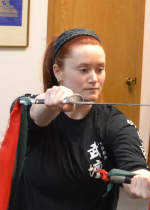 Some photos are posted on the Photos page of last weekend's Six Harmony Spear seminar. The weather was great. A Six Harmony Spear seminar will be held Aug 2nd & 3rd, from 1pm to 3pm each day. Location for this seminar is the Ray E Storck Homestead Park on Clark's Rd near the top of Rabbit Creek Rd. Nick has reserved the sheltered area at the park (in case of rain) from 11am to 3pm each day so there is plenty of time for warmup or practice. Alisa has spears on order; they will be for sale. 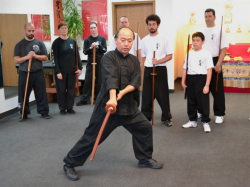 The spear was Great Grandmaster Li Shu Wen's weapon of choice and this form was handed down by him. In northern China, Six Harmony Spear is a very popular system and in the old days was considered to be one of the most respected martial arts. Tecniques include silk-reeling, linking and wrapping with both body and spear. Don't miss this one. Here is the Chinese spear article in wikipedia. 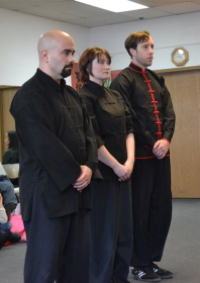 Some photos are posted on the Photos page of last weekend's Kuen Wu Jian seminar. The spear seminar is on track for August 1st & 2nd 2nd & 3rd. Details will be posted here. 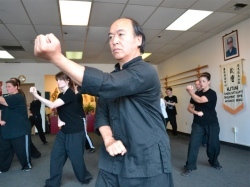 The Kuen Wu Jian seminar will be from 1pm to 3pm on Saturday, June 21 & Sunday, June 22. A spear seminar is proposed on the weekend of August 2nd & 3rd. Check here for updates. 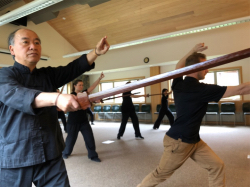 A Kuen Wu Jian (Chinese double-edged sword form) seminar is proposed for June 21 & 22. The jian was Grandmaster Liu's weapon of choice. Don't miss this one. Here is the jian article in wikipedia. 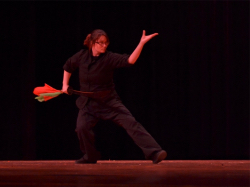 Some photos are up on the Photos page of the Asian Cultural & Martial Arts Expo '14 at West High. This year's Martial Arts Expo will be held on Saturday, March 1st, from 5pm until 7pm at West High School Auditorium. Participants please check-in at 4:15pm. This will be the school's 31st year of participation in this event. 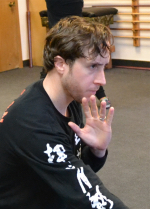 1) Push Hands, Laoshi (instructor) Nick Lynch, Wednesdays from 7:30 to 8:30 pm. 2) Miao Dao, Laoshi Krystal Schott, Fridays from 7:30 to 8:30 pm. Class descriptions and curriculums are being developed and should be on this site by the end of the month. Updates and links will be posted on this page. These classes are very much anticipated. Thanks to Master Kurt Wong, Nick and Krystal for offering them. Photos from the BP expo should be up in a few days. Final rehearsal for the Chinese New Year celebration will be 3pm at East High. Setup is at 2pm. People participating in the BP Expo, please show up at 4pm Friday at the BP atrium. 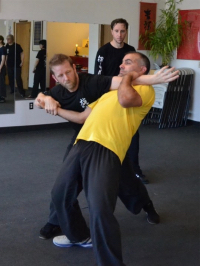 Very much a hands-on seminar from Sifu Kevin Walle. Some photos are up on the Photos page. Master Kurt Wong welcomed 4 new disciples, Monica, Tyson, Elisabeth, and Taha to Wu Tan at a cermony held last Saturday. A few photos are posted on the Photos page. Seminar photos should be up in a few days. 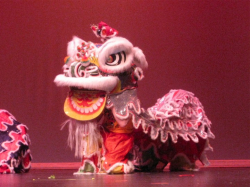 Chinese New Year (Year of the Horse) celebration will be Sunday, February 2, 2014, at East High School. Rehearsals for Wu Tan participants will be on Sunday mornings, beginning between 10:30 and 11:00am, January 5, 12, 19, & 26. Final rehearsal is 4pm, Saturday, February 1, at East High School. 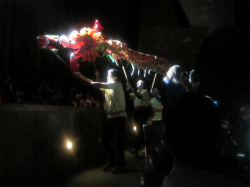 Dragon Dance rehearsals are scheduled for Sunday afternoons, 3:30pm, January 5, 12, 19, & 26 at the Asian Cultural Center. Also scheduled is an Expo for BP, 5pm 4pm, Friday, January 31, at the BP Atrium. Changes and updates will be noted on this page. A discipleship ceremony for the induction of new disciples will be held from 4pm to 5pm on Saturday, January 18. All disciples, new and old, please attend. Later, at 6:30pm, there will be a potluck at Master Wong's house. Chin Na Tecniques - Saturday, January 18, 1pm to 3pm. Applications from Preying Mantis, Tai Chi & Long Fist - Sunday, January 19, 1pm to 3pm. A Chin Na & Applications seminar is proposed for January 18th & 19th. 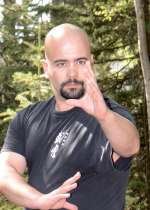 The seminar is offered by Sifu Kevin Walle and will take place at Alaska Wu Tan in Anchorage. Watch this page for further details and for news on the upcoming Chinese New Year (Year of the Horse) celebration in February. Not much room to spare at the Miao Dao seminar, but everyone stayed focused as can be seen on the Photos page. September 15, 2013 __ Taiwan and Australia Tour webpages. Links to the Taiwan and Australia Tour webpages are at the top right of this page. 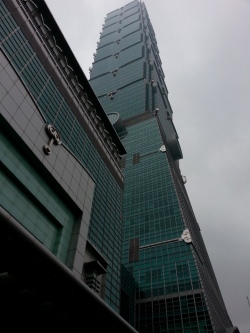 Alisa's Taiwan Diary and more photos have been added to the Taiwan page. The Australia part of the tour now has its own page. Both pages are under construction with more content on the way. Some photos are up on the Photos page of last Thursday night's Ba Bu Basics and Seven Hands workshop. Seminar photos will be up in the near future. 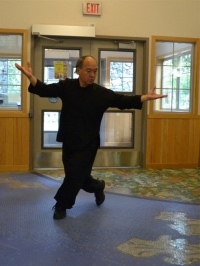 In addition to the Praying Mantis seminars September 7th and 8th, Master Wong is offering a 2-hour workshop Thursday, September 5th, 7pm to 9pm. Subjects will be Seven Hands and Ba Bu Basics. Thursday classes may be rescheduled to Sunday; check with instructors. Just a reminder: Miao Dao and Tang Lang Zai Yao seminars will be held Saturday and Sunday, September 7th and 8th, from 9am to noon and 2pm to 5pm each day. A combined Beg. / Inter. & Adv. 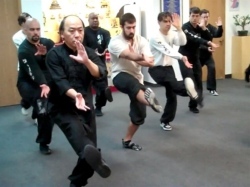 Kung Fu class will be Thursdays, 7:30-9:00pm. Tuesday's Kung Fu class is now a lab. Low Impact Tai Chi on Thursday adjusted to 6:15-7:30pm. Tai Chi Saber class on Fridays will be 6:00-7:30pm. Something new: Hsing-yi. Some photos are up on the Photos page of the seminar on June 15. A get-together will be held Sunday, June 16, at 11am to review photos, videos, and stories from the trip to Taiwan and Australia. All are invited. Disciples Class on Sunday, June 1, will be from 3pm to 5pm. 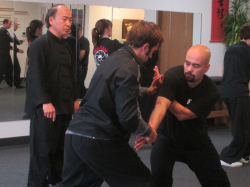 June: A Hsing Yi seminar is scheduled for Saturday, June 15, from 2pm to 5pm. 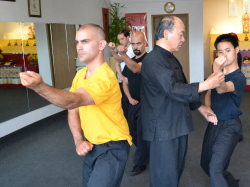 September: Miao Dao and Tang Lang Zai Yao seminars will be held Saturday and Sunday, September 7th and 8th, from 9am to noon and 2pm to 5pm each day. There will be a meeting at 11am, Sunday, April 14th, for all going to Taiwan. Possibly a seminar in June. No specific information or dates yet. More definite is a Praying Mantis seminar Sept 7th & 8th. Check this page for details. 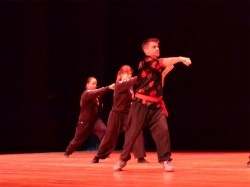 Some photos are up on the Photos page of the Asian Cultural & Martial Arts Expo '13 at West High. The meeting has been rescheduled to 11am, Sunday, March 17th, for all going to Taiwan. This year's Martial Arts Expo will be held on Sunday, March 3rd, from 4pm until 6pm at West High School Auditorium. Participant check-in begins at 3:15pm. Rehearsal for the expo will be at 11am, Saturday, March 2nd, at the school. There will be a meeting at 11am, Sunday, March 10th 17th, for all going to Taiwan. Classes this weekend are rescheduled for other use of the studio. Disciple's class will be 7:30am to 9am, Sunday, Feb 24. Other Sat and Sun classes are also rescheduled. Please check with instructors. ...for Chinese New Year demo. Class on Feb 2nd will go from 10am to 1:30 for all demo participants (Sam, Lindy, Howard, Kelton, and Jaeus). A lunch or snack may be brought. There will be class, as well as a dress rehearsal at East High on the 9th.Please stay informed for adjustments on that week. Master Wong plans a seminar for next spring. No specific information or dates yet. Check this page for details. Master Wong has returned from a rather challenging journey to Taiwan. His goal was to plan an itinerary and schedule for next spring's group tour of Taiwan under his guidance. Check with Nick for tour details. News and updates will be posted on this page. Here are some photos (with apologies from the website guy for being so late) of the August seminars: Tang Lang Ba Bu Intensive, and 8 Hard & 12 Soft. Here again is the link to Sifu Kevin Walle's "Mantis' Hard (and Soft) Sell" for further reading on the techniques covered in the seminar. Summer in Alaska. The days are long and everyone is busy. Nevertheless, please take time to sign up for the August seminars. The signup sheet is on the wall. Enough people need to sign up or we risk not having the seminars. Tang Lang Ba Bu -- Sat and Sun, August 18 and 19, 8am to 11am at Girdwood Community Center / Gerrish Public Library. 8 Hard and 12 Soft -- Sat, Aug 18, 2pm to 5pm in Girdwood and Sun, Aug 19, 4pm to 6pm at Wutan studio in Anchorage. 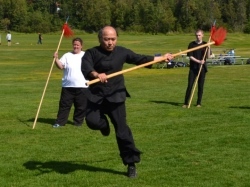 Following the success of June's lan men dao seminar, Master Wong plans a double seminar the weekend of August 18 & 19. Saturday and Sunday morning from 9am to 12 noon, Tang Lang Ba Bu Intensive Training and form: Xiao Fan Tser (Small Turning Wheel). This will be followed by the afternoon's seminar from 2-5pm: Praying Mantis 8 Hard & 12 Soft Movements. Both seminars / workshops will be held at the Girdwood Community Center / Gerrish Public Library building in Girdwood. These techniques are essential for both new and advanced students of Praying Mantis. Sifu Kevin Walle's "Mantis' Hard (and Soft) Sell" offers insight into the afternoon's seminar. The lan men dao workshop / seminar will be held June 16 & 17, 1:15 pm to 4:15 pm each day, at the Girdwood Community Center / Gerrish Public Library building in Girdwood. This seminar is open to all. Wooden sabers will be available for lend or buy if you don't have one. A seminar/workshop by Master Wong is being planned for June. Proposed time and date is 2 sessions of 3 hours each the weekend of June 9th & 10th. Proposed location is the community center in Girdwood. Proposed subject is lan men dao, a relatively long saber form. At this time, all details are subject to change. This seminar is open to all. Also in the planning stage is a seminar/workshop in early August, possibly the miao dao (2-handed saber short form) and applications. The Fur Rondy Asian Cultural and Marial Arts Expo '12 will be held at West High School auditorium, Saturday, Feb 25, 2012, at 4:30 pm. Friday evening class, Feb 24. A few more photos from the Baji-Piqua Combined Form seminar have been added to Photos, thanks to Peter Ryan. 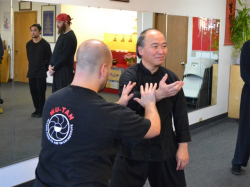 Master Wong would like to have an instructor's meeting tomorrow, Sunday, Jan 29, at 10:30am. Please let him know if you are unable to attend. Some photos are up on the Photos page of the New Year's celebration at East High. The Baji-Piqua Combined Form and Chen Tai Chi Application seminars were both well-attended and very successful. Photos are up on the Photos page, with more to be added soon. Rehearsal Wed, Jan 18, at 7pm at Wu Tan. Rehearsal Fri, Jan 20, at 7pm at Wu Tan. Rehearsal Sat, Jan 21, at 5:30pm (doors open at 3:30, warmup at 4:30) at East High School. Anyone with corrections or more accurate information, please email Charlie at info@wutanalaska.com. Derek is hosting a disciple's barbecue next Sunday, Jan 15, at 6pm. Potluck, so bring a dish and a big appetite, which should be no problem after the day's seminars. Directions will be emailed soon. See Derek for details. Kid's and Youth classes will be extended 1/2 hour until Chinese New Year Celebration on Jan 22: Kid's class 10am to noon, and Youth class 11:30am to 1:30. Any further adjustments will be noted on this page. Please check back. Kid's and Youth classes will be held as usual on both Christmas eve and New Year's eve. No classes Sunday, Christmas Day, and Sunday, New Years Day. No Tai Chi classes Monday, Dec 26, but classes Mon, Jan 2 will be held as usual. 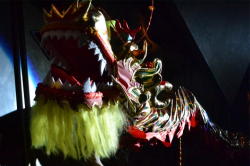 Volunteers are needed in the kitchen for the Chinese New Year Celebration, Sun, Jan 22. Help is mainly needed for serving food, 11am to 1:30pm. Please contact Master Wong at 830-2500. 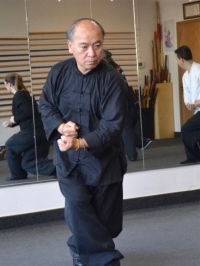 Master Wong has proposed 2 seminars, each seminar held on 2 days as follows: Baji-Piqua combined form for disciples, 8:30am to 11:30am, Sundays, Jan 8 & 15, and Chen Tai Chi applications, open to all, 1:00pm to 4:00pm, on the same days, Jan 8 & 15. Please plan to attend, and sign up early. No classes Sunday, Christmas Day, and Sunday, New Years Day. No Tai Chi classes Monday, Dec 26, but classes Mon, Jan 2 will be held as usual. Saturday classes to be determined and posted here soon. Any changes will be noted on this page; please check back. 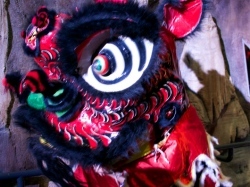 Chinese New Year of the Dragon Celebration is coming up fast (Jan 22) and volunteers are needed for the Dragon Dance. 3 more rehearsals are scheduled on Sunday afternoons: Dec 18, Jan 8, & Jan 15, 4pm to 5pm at the Asian Cultural Center (next to the Spenard Rec Center). There will be no classes on Thanksgiving Day. All other classes will be held as usual. The quarterly Instructor's Meeting will be held Sunday, Nov 27, from 11am 'til noonish. Instructors, please attend. More photos of the very successful Piqua seminar have been added to the Photos page. For anyone who hasn't seen them, the new T-shirts are in; see Master Wong or ask an instructor. The Photos page has been reworked. Three photos from the Piqua seminar (first half) last Sunday have been added under Seminars. "Unbridled enthusiasm" might be a good phrase to describe last Sunday. Each of Master Wong's seminars seems to be better than the last. More "Thoughts of Grandmaster Liu" have been added to the Quotations page. The Trees page is online in Lineage. It includes a downloadable pdf file of Master Su's updated chart, thanks to Alisa and Marit Ramberg of Pachi Tanglang Martial Arts Institute - Norway (Norwegian). Oct 14, 2011 ____ Seminar__Re-posted as a reminder. The 4 Lines of Piqua seminar will be held on Sunday, Oct. 23, 9am 'til noon and Sunday, Oct. 30, 9am 'til noon. Open to disciples only, it is highly recommended that all new disciples attend. Signup sheet is posted on the wall. Mencius has been added to the Reading List section of the library, and see the new Quotations page, also in the library. It has some "Thoughts of Grandmaster Liu", translated by Master Wong and transcribed by Alisa. 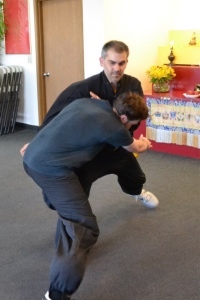 An Inside Kung Fu article "Ba Shi: The 8 Basic Stances" by Richard Miller has been added to the Articles section of the library, and the Photos/Stances page is back. Four class curriculums have been added; they can be viewed by clicking on links in the Class Descriptions page. Praying Mantis Intensive and Fundamentals starts October 2nd and will be held every Sunday afternoon, 1pm to 3pm. The emphasis in this class will cycle through conditioning, basic drills and forms, and applications of Praying Mantis. All students are welcome. Instructor is Dan Bolinder. You probably noticed the new introduction on the home page, thanks to Alisa. Also, an Inside Kung Fu article by Kevin Walle, "Mantis' Hard (and Soft) Sell" has been added to the Articles section of the library. The Videos page has been moved into the newly created Library, along with Articles, Reading List, and Glossary. Contributions to the reading list and help with the glossary would be very welcome. The magazine articles are excellent and timeless; more to come. The highlight of today's Instructor's meeting is a proposed seminar on the Basic Lines of Piqua, tentatively scheduled for Oct. 23 & 30. That is 2 Sundays, 3 hours each day, 9am to noon. This seminar would be mandatory for new disciples. There will be a signup sheet soon. Also of note, a proposed new class on Tuesday, details forthcoming. Dan's Sunday class will be changing from Long Fist to Praying Mantis Intensive and Fundamentals, ...emphasis on the intensive. Next Instructor's meeting is scheduled for 10:30am, Sunday, Nov 27. The Instructors page is online. Revised Schedule is online. A few photos have been added and also a playlist of Master Su's videos. Most website pages are online; some are under construction. The Schedule should be up very soon. Thanks to Master Wong for keeping everyone focussed. Thanks to webmasters Nita and Charlie. Thanks to Byron, Elan, Alisa, and Peter Ryan for their contributions. And thanks in advance to all of you who will be contributing soon. Instructors, we need your bios and some photos. Contact Master Wong, Nita or Charlie. One website page is published; the name wutanalaska.com has been retained. We hope to have much of the site up in the coming week. There are some gaps in content; ideas, photos and text are all welcome. Talk to Master Wong, Nita or Charlie. Master Wong reports he is pleased with the results of the tournament in Las Vegas the weekend of Aug 12-14. 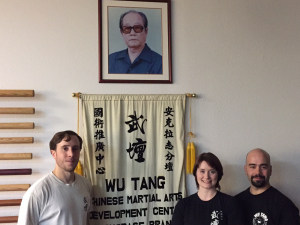 Wu Tan Alaska was well represented by Sifu Jacob, Nick, Krystal and Nita; they brought home ten medals. See a youtube playlist that includes Master Wong's interview by a Las Vegas TV station (In Chinese; English at 3:55; action at 5:00); wherein he demonstrates praying mantis and baji to an impressed interviewer and bystanders. 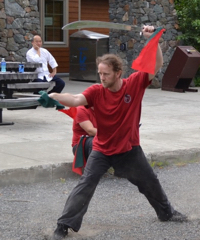 The "Secret Door" (Tanglang Shou) praying mantis and bagua sword seminars were held in the Girdwood community center over the weekend of July 16 and 17. Both seminars were well attended, the facility worked out well, and the weather was good. All in all a great success. A few photos are here. given to Wu Tang Magazine in May of 2011.
from Inside Kung Fu and others.